At first glance, Apple’s latest iMovie 10 looks like a brilliant move. Not least because it’s free. But, as seems to be the way these days. Apple has lost its attention to detail and quality control. Today, I got what seemed like a nice surprise. iMovie 10 can edit video shot on GoPro’s hugely popular Hero 3. Until now, you needed to convert files to a format that iMovie could edit. I shot a test film today. Most of the video from my bike ride uploaded to my Mac. I added the missing files later. But iMovie couldn’t cope with the fact I hadn’t uploaded them all at once. Although it successfully copied the edited film to iMovie’s Theatre mode (sorry – Theater – no concession to non Americans here…) it proved impossible to share the final video. 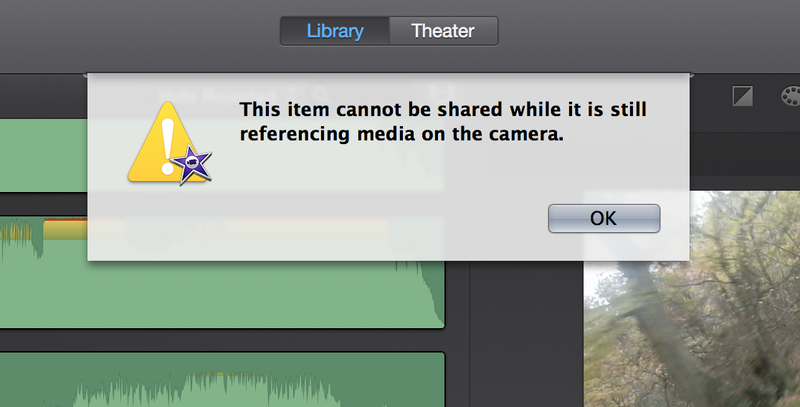 It would only recognise the other files on the camera, not the Mac. This entry was posted in Cycling, Tech by Rob Skinner. Bookmark the permalink. And me too! I have imported clips from a new Sony HDR CX 330E. All the clips have been imported succesfully and can be edited, but about half of the clips are not recognised if the camera is not connected and the whole project cannot be in any way exported. I am having this problem too – what is most disconcerting is I have found 100 posts like this one and not one post seems to have a solution! same problem. Hello apple? Detach from the camera. PLEASE!!! Couldn’t be that tough??? ?